Space is the place. 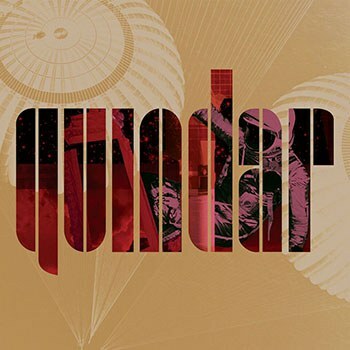 On Hip Mobility, Quindar's two-man instrumental combo provide a lush, futuristic soundtrack of NASA's glory days. Quindar refers to the transmission tones, or “beeps” heard during the Apollo space missions. It’s also the name of a curious electronic music duo consisting of Wilco keyboardist Mikael Jorgensen and art historian/curator James Merle Thomas. The band name is fitting, as it represents a concerted effort to marry music with space travel. The backstory behind Quindar (the band) is a unique one. After accepting an invitation to attend the Apollo 11 space launch to the moon in July 1969, artist Robert Rauschenberg created a series of more than 30 pop art lithographs (Stoned Moon) through the use of press kits, technical documents, schematics and even more unusual items such as hotel menus and photographs of oranges. This approach tended to bypass most of NASA’s official pageantry to combine the technical aspects of the space program with the more mundane symbols of the era. Less than a decade later, Larry Sultan and Mike Mandel -- two young artists in San Francisco -- took on a similar project. Evidence consisted of several thousand photographs from NASA’s archives -- stark black-and-white images depicting all manner of space research, much of it leaning towards the banal and odd: men in blazers and hard hats inspecting fire retardant material, a lone car burning in a field, primitive-looking strands of cables pouring out of computer mainframes. Think "David Lynch meets The Right Stuff." Jorgensen and Thomas used these artworks as the basis for a multimedia project, combining the images in a live music setting with instrumental electronic music that often samples clips from NASA audio archives. The music on Hip Mobility, however, never really exploits the audio samples in a forced manner; the compositions are not overloaded with all the usual “Houston, we have a problem” soundbites. Rather, the space program sounds are used relatively sparingly and tastefully, nicely augmenting the already rich sonic atmosphere. Although primarily electronic in nature, the music has a warm, inviting vibe and an almost chill-out feel reminiscent of bands like Thievery Corporation. You could call it dance music, but it’s lush and subtle and virtually devoid of dancefloor bangers. Album opener “Twin Pole Sunshade for Rusty Schweikart” is an understated, mid-tempo scene setter with an insistent, skittering beat under luxuriant synth chords. “Wembley” shifts gears with its lazy funk beat and sharp keyboard stabs that weave their way in and out of mission control announcements like “First stage engines will ignite at three-point-one seconds.” It’s an odd combination, but it works -- Jorgensen and Thomas are masters of creating the perfect ambience. The synthetic nature of much of the music occasionally takes a backseat for a more organic approach. “Italian Conversation” has a lovely, relaxing Mediterranean feel, thanks to a couple of acoustic guitars combined with tastefully executed retro-synthesizers. “Arabella & Anita” evokes film scores from a bygone era, with dramatic piano and strings reminiscent of a long-lost Ennio Morricone recording session. For an album that is focused on a unique, singular concept, the tone of the album is full of variety. For every stark film score moment, there’s a dash of playfulness. Album closer “Honeysuckle This Is Houston” is a light, infectious slice of plastic dance funk. The track opens with the aforementioned Quindar tones before quirky, robotic blips and beats take over. Samples of NASA’s best and brightest pepper the song, creating yet another quirky dichotomy where space exploration lives comfortably alongside techno beats. It’s important to note that this project’s background shouldn’t dissuade music fans uninterested in NASA history from checking out the music. While Quindar is based on the unique conflation of space exploration and art, it is, after all, still art. A warm, multilayered collection of music that just happens to be alive with the rich, historical pulse of space.